Biodiversity offers great potential for managing insect pests. It provides resistance genes and anti-insect compounds; a huge range of predatory and parasitic natural enemies of pests; and community ecology-level effects operating at the local and landscape scales to check pest build-up. This book brings together world leaders in theoretical, methodological and applied aspects to provide a comprehensive treatment of this fast-moving field. Chapter authors from Europe, Asia, Africa, Australasia and the Americas ensure a truly international scope. Topics range from scientific principles, innovative research methods, ecological economics and effective communication to farmers, as well as case studies of successful use of biodiversity-based pest management some of which extend over millions of hectares or are enshrined as government policy. 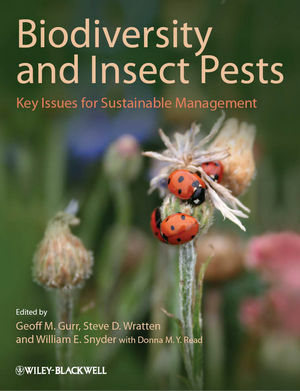 Written to be accessible to advanced undergraduates whilst also stimulating the seasoned researcher, this work will help unlock the power of biodiversity to deliver sustainable insect pest management. Visit www.wiley.com/go/gurr/biodiversity to access the artwork from the book. Geoff Gurr is Professor of Applied Ecology at Charles Sturt University in Australia. Over the last two decades he has worked on the ecology and management of pests in systems as diverse as pastures and forests. Much of his recent work has been with collaborators throughout Asia where insecticide resistance in sucking pests of rice has driven the development and adoption of biodiversity-based management strategies. Steve Wratten is Professor of Ecology at Lincoln University, New Zealand and Visiting Professor at Charles Sturt University in Australia. His main research concerns evaluating and enhancing "nature's services" (ecosystem services). Using resource economics techniques, the existing value of these services (such things as biological control of pests) is estimated and then habitat manipulation ("ecological engineering") is used to enhance these services on farmland to provide profit and real evidence of sustainability. This work is done across several agricultural sectors but especially in vineyards. William Snyder is Professor of Entomology at Washington State University, USA. With the help of a small army of students and postdocs, he explores the relationship between biodiversity and biocontrol. Recent work focuses on the relative importance of the two components of biodiversity, species number (richness) and species balance (evenness), and practical ways for farmers to harness biodiversity's many benefits. Donna Read is a Research Assistant at Charles Sturt University, Australia with interests in rural sociology, agricultural economics and horticulture.